Since the founding of the International Brotherhood of Electrical Workers over a century ago, one of the basic tenets of the IBEW has been that, if you work in the electrical industry, you belong in the IBEW and are entitled to the decent standard of living that membership entails. Local 102 has long been recognized as a leader in organizing the un-organized, and fostering the spirit of brotherhood on which the IBEW is based. Presently we have two full time organizers on staff: Mark Roche, New Jersey jurisdiction, other than Hunterdon and Warren Counties, and tele-data. Mike Pulsinelli, Hunterdon and Warren Counties and Pennsylvania jurisdiction. IF YOU ARE DOING ELECTRICAL OR TELE-DATA WORK ON ANY PUBLICLY FUNDED PROJECT IN THE AREAS REPRESENTED BY OUR LOCAL UNION, YOU OWE IT TO YOURSELF TO MAKE SURE YOU ARE RECEIVING THE PROPER WAGES. IT'S THE LAW!!! If you are working on any public job and feel that you may not be receiving the correct wages, you can call a Department of Labor office (numbers listed below) or call or e-mail one of our organizers and he will investigate and see that you receive your fair wage. All information will remain strictly confidential. If you are doing business in the jurisdiction served by Local Union 102, please feel free to call and speak to one of our organizers about the advantages your operation can gain by having the best trained, most highly motivated craftsmen at your call. 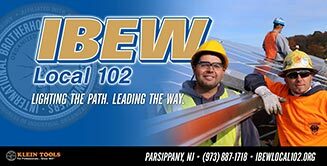 From high voltage power to the latest in sophicticated computer and fiber-optic networking, the skilled members of IBEW 102 stand ready to enhance your business opportunities. Those dealing with smaller clientele should also be aware of the area's "Small Works" agreement, which gives contractors the ability to compete with un-organized shops and still avail themselves of the training and talent that we offer. There are also residential and tele-data rates for businesses in this sector of the market. Members in each of these classifications are backed by the same high standards of training and craftsmanship that apply to the "A" classification. There are no rigid rules for members working "out-of-class" so long as they are paid the proper rate for the work being performed. Remember that the mission of Local Union 102 is to "organize the un-organized." We welcome those employees who have helped you grow, and actively seek their membership. There will never be any demand for you to "fire your workers and hire ours." We seek only to make our industry a better place for craftsman and contractors alike to enjoy a decent standard of living for a job well done.